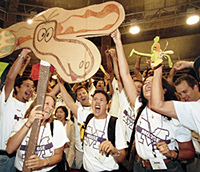 CIM Week '01 carries on the Kellogg spirit. Kellogg students contribute muscle to the community as part of CIM Week service projects. Kicking off the morning of Sept. 11, CIM Week began on an uncharacteristically somber note. Even so, CIM Week organizers pressed forward with most of the week's events, offering the school's newcomers a full initiation into the Kellogg culture and spirit. "CIM Week is a vehicle for passing on the Kellogg culture, and the culture is what makes this such a great school," explained Jeff Zeunik '02, chairman of the CIM Week executive committee. "If we didn't have CIM Week for this class, in theory we could have lost [the culture] forever. If was a tough decision, but we had to carry on." Kellogg students celebrate the new school year with a formal ball, held at Union Station. The week included most of the hallmarks of CIM Week past - section cheers, the Team Challenge, guest speakers, and constant opportunities for students to eat, meet and bond. The Club Fair let students promote their groups, while service projects put Kellogg muscle in the community. 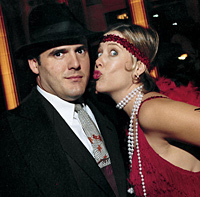 Events culminated Saturday night with a Roaring 20s formal at Union Station in downtown Chicago, complete with fedora-topped actors masquerading as "gangsters." Keynote speaker Bob Eckert, CEO of Mattel, was forced to cancel his live presentation on Saturday, due to the nation's stoppage of air travel. However, Eckert, who was in California, delivered his planned presentation twice, via live feeds on both Friday and Saturday, to ensure that all students would be able to hear his remarks. CIM Week organizers also postponed the Friday diversity talent show. The event had coincided with a candlelight vigil in Evanston, and organizers felt it would have been inappropriate to have the talent show on the same night. It was a good decision, as an "overwhelming" number of students attended the vigil, Zeunik said. Kellogg students build skills during the CIM Week Team Challenge. The show was rescheduled for Sunday evening, and became more of an open-microphone event than one based on section skits. One student performed a song he had written in memory of those who had died in the attacks. The chorus included the refrain, "We will remember." "He got it right," said Nancy Rosen '03, who called the week a "mixture of joy, sadness, fresh starts, uneasiness and anticipation." Tracy Eckert '03 found the Team Challenge, during which students bond while competing in less-than-dignified athletic events, a particular highlight. "It's funny, because you think you're all adults," said Eckert (who is not related to Bob Eckert). "You think, 'I'm going to put my head on a bat and spin around? I'm going to totally embarrass myself!" Kellogg students cheer for their class sections during CIM Week. But if Eckert felt embarrassed, she wasn't alone. Hundreds of her classmates underwent the same initiation, losing their inhibitions but gaining friends. CIM Week organizers were heartened by the determination with which many students participated in the week. "This has been the worst week of my life, but it's also been the best week,'" Zeunik said he was told by one student. "'It was the worst week because of everything that's happened, but it was the best week because you guys did the best you could with it.'" "That meant a lot to us," Zeunik said.